Are you taking full advantage of all your data? In today’s digital world, there is no shortage of data on anyone or anything. The real problem for most organizations is how to get to that data—and get it into a usable format. Any sort of analytics involving big data can be very time-consuming, if not downright impossible, rendering your data useless. If you’re attempting analytics on a large volume of data on premise—which can be further complicated when data is being collected across multiple Cloud solutions and on-premise systems—you are working at a deficit because you’re being held back by your infrastructure, resources, and/or your hardware. The answer: a move to the Cloud. 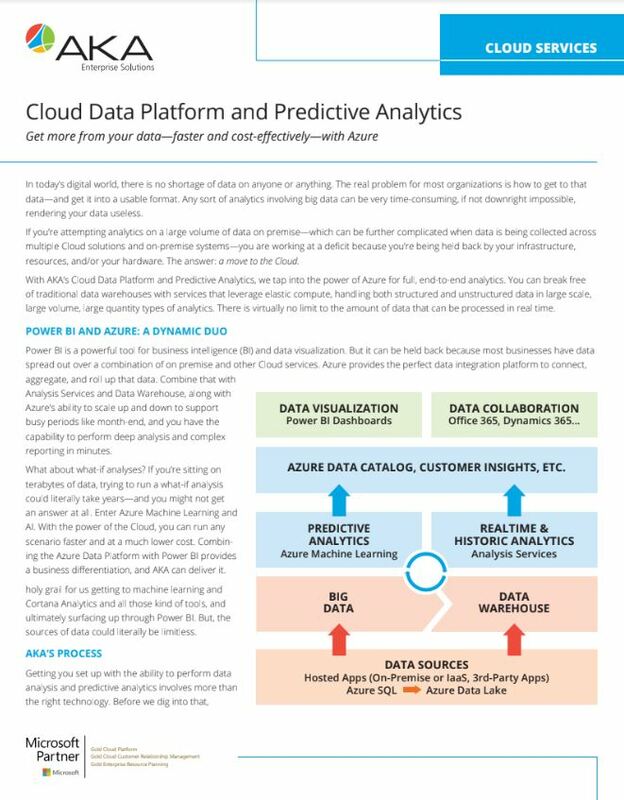 With AKA’s Cloud Data Platform and Predictive Analytics, we tap into the power of Azure for full, end-to-end analytics. You can break free of traditional data warehouses with services that leverage elastic compute, handling both structured and unstructured data in large scale, large volume, large quantity types of analytics. There is virtually no limit to the amount of data that can be processed in real time. Power BI is a powerful tool for business intelligence (BI) and data visualization. But it can be held back because most businesses have data spread out over a combination of on premise and other Cloud services. 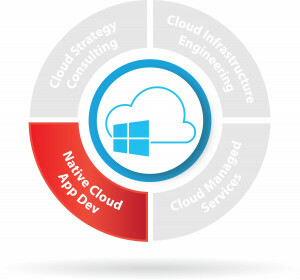 Azure provides the perfect data integration platform to connect, aggregate, and roll up that data. Combine that with Analysis Services and Data Warehouse, along with Azure’s ability to scale up and down to support busy periods like month-end, and you have the capability to perform deep analysis and complex reporting in minutes. What about what-if analyses? If you’re sitting on terabytes of data, trying to run a what-if analysis could literally take years—and you might not get an answer at all. Enter Azure Machine Learning and AI. With the power of the Cloud, you can run any scenario faster and at a much lower cost. Combining the Azure Data Platform with Power BI provides a business differentiation, and AKA can deliver it. Getting you set up with the ability to perform data analysis and predictive analytics involves more than the right technology. Before we dig into that, we start with understanding your processes, requirements, the tools you already use—so we can tailor a solution that fits your business. Needs assessment. The first step is to identify your reporting needs. We conduct a Workshop with you to determine which groups/departments are involved, who/what roles will be access the data, and what ways they’ll be accessing it. Do you need static reports? Do you need Excel-based access? Visualizations? From there, we identify all your existing data sources and, based on your reporting requirements, we identify which Azure services will be used and in what configuration. With so much flexibility and so many options —Azure Data Lake Store, SQL Server Analysis Services, Azure SQL Warehouse—we can optimize your solution to precisely meet your reporting requirements. Scope definition. After your needs have been identified, we then define the scope of the project by looking at the volume of data, the integration points, and the tools we will use to extract data from existing systems and move it to the selected data source. Build out. Next, we begin to build out your reporting mechanisms, including Azure services, SSRS, and Power BI. In short, remember ETL: Extract, Transform, Load. We extract from these locations and move it to a central “location” (the Azure Data Lake) it is transformed (analyzed), and then set it up so it can be loaded into whatever tool or format you desire. That’s the beauty of the Azure Data Lake: the data source format can be anything—Excel, PDF, Word, ERP, CRM—and is never an issue. With your Azure Cloud data platform in place, you can also take advantage of Cognitive Services. This allows you to do textual analysis to help understand what types of conversations or meetings are occurring, as well as the content of those conversations or meetings. Once that data is analyzed, you decide how you want it consumed—static report, Power BI, dashboard, fed back into CRM—whatever you need to help make decisions, it can be done…and in minutes instead of months or even years, and at a fraction of the cost of traditional methods. Most importantly, you can begin getting real, tangible business value from your data that can give you a competitive advantage.